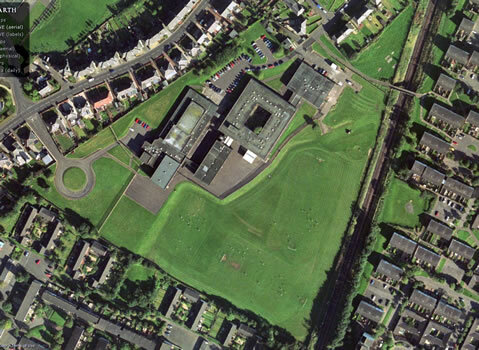 The story of St Michael's Academy in Kilwinning and Irvine - with a potted history on a timeline. St Michael's Academy opened in Irvine in 1921. In 1965, it moved into new premises in Kilwinning, and in 2007 merged with St Andrew's in Saltcoats to become St Matthew's Academy. These pages were produced by retired St Michael's P T Classics Ian J Dickson, and are based on the 1921-2007 history book, to the production of which he contributed. All 1000 copies were sold between June and September 2007. This article was written in 1966 by Edward Thomson (5th year), but both its title and its sentiments seemed just as relevant in 2007, as we prepared to move into a new building. I looked upon the old St Michael’s buildings as an old, well-worn pair of socks. They have done their job. The new school is being broken into a routine. To do this, pupils are needed. I am one. On first entering the new school, I felt that there was something missing. It had no character. The walls were cold, awaiting life. Despite the bright colour and the excellent lighting, there was no cheery glow. I felt lost. But soon after the pupils filed through the new building, I sensed a heart beginning to beat; faintly at first, though developing a much livelier rate on the second day. Now I feel the new school has a character. I think it has the same character as the old school, possibly because of the presence of the same teachers! At this school I am happier when I am learning. I know I need not walk across a playground in pouring rain, when I am changing classes; I know that the scientific equipment is up-to-date, and keeping pace with the progress of science. I know that the teachers are proud of this new school, and that they are teaching just a little bit better than before. These things urge me to do a little bit better too. The old school with its out-of-date buildings never held any attraction for me. The character and atmosphere were there but sometimes they were eclipsed by the dreary surroundings. Battle-scarred desks and well-worn floors do not inspire a pupil to success. I was then proud of the school as a society, not of its physical appearance. Now I am proud of both. The modern building makes one look to the future – an attitude necessary in this age of fast living. The mere fact that I am a pupil of the new St Michael’s has broadened my outlook, lifted the clouds of depression from my ‘student mind’, lightened my step, and made me look forward to a further year of education. Celebration was the keynote of our Kilwinning era Silver Anniversary magazine, published in 1990, and is so again in this our final publication. However this time we are celebrating St Michael's College and Academy from its birth in 1921 until its demise in 2007. St Michael's has a long and proud history. Our motto "Aeterna non caduca" serves to remind us that “Eternal things do not perish." So, despite the fact that the fabric of the building will soon disappear, the "eternal" things which made our school special will live on. We can remember with pride the achievements of our former pupils – not only those who have excelled in the fields of politics, literature and business, or who have gone on to serve the community as priests and nuns, teachers, dentists and doctors, but others too whose lives have been fashioned by the education which they have received over the years. An aerial view in 2001 - the buildings were demolished in 2008. Another aerial photo appears on the Buildings page. Serving on this Committee has been, for me, a very pleasant and rewarding experience. Under the informal and relaxed, but never-theless extremely competent, chairmanship of Josephine Buchert, we - Ian Dickson, Frances O'Neill and I - met, most Wednesdays between September 2006 and May 2007, at lunchtime. Our magazine became a book, at Ian's suggestion; he felt that this would form a more permanent record of our school and its achievements. I wish to thank all three of my colleagues for being so agreeable and helpful, but I know that both Josephine and Frances will want to join with me in according special gratitude to Ian for the many hours of his own time which he has spent in editing and formatting the book; his commitment to this venture has been outstanding, and this must be acknowledged. Josephine and I had worked with Ian on the Silver Jubilee Magazine and we were aware that master-minding such a publication was one of his many areas of expertise. All our readers will, I am sure, agree that this volume, as it now appears, is a fitting testimony to Ian Dickson's dedication to St Michael's [and his wife Louise's uncomplaining support - Ed. ].